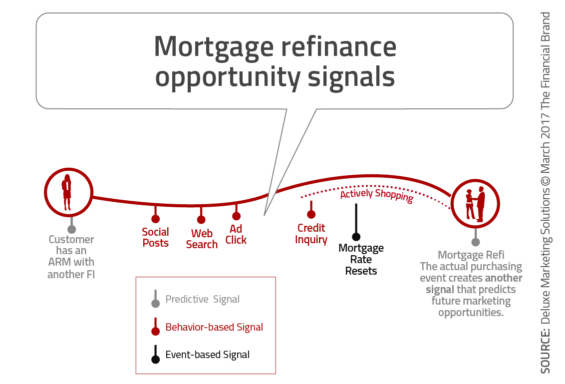 Financial institutions have long used signals, like new mover lists, to spot consumers who might be prospects for loans or other financial products. A new wave of data that shows intent to buy can take this effort to a whole new level. Financial marketing has long relied on triggers — one type of marketing signal — to identify new prospects. Milestones like getting married or buying a new home are widely recognized as signals that a consumer might have a financial need. Improved data access, enhanced modeling, and advanced analytics are changing the game. We can now spot consumer actions, like hard credit inquiries, that show a clear intent to purchase, and thus a need for a financial product. Awareness of the customer journey. Mapping of the purchase journey that tells you where, when, where, and how to message to your customers. Increased personalization. Amplifying reach and providing relevant and timely offers — which, in turn, yields higher response and conversion rates as well as customer satisfaction and loyalty. By combining the insights gained from both newer and more traditional signals, knowledge of the customer journey, and the components of a strong, targeted marketing program, a financial institution can step in as a resource before the consumer makes a decision with an offer tailored to their specific needs. What Marketing Signals are Available Today? Signals are pieces of information consumers and businesses create through their everyday actions that indicate they are potential customers. Examples include making purchases, searching online, clicking on ads, applying for new loans, and paying off debt. Behavior-based. These include both explicit behaviors, like hard credit inquiries and online searches that signal intent to purchase, and subtle behaviors like filing a change of address form that might be an indicator of a future need. Event-based. Events like an auto lease expiring, an adjustable mortgage rate resetting, or a child going off to college are signs the customer may be about to experience a significant financial shift and might require a new financial product in the near future. Predictive. While these passive signals, like debt that’s ripe for consolidation or a higher-than-average mortgage rate, don’t show intent, they help identify prospects who could be helped by an alternative financial product. Signals are more than just a way to target. They give you the information you need to build responsive, intuitive, customer-centric marketing programs. Customer knowledge. 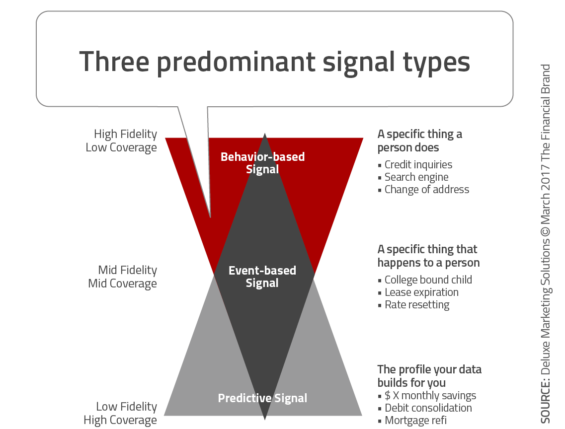 Signals give you insight into a potential customer’s expectations and where they are in the customer journey. Personalization. By knowing what customers are looking for, you can serve up content that meets their needs. Improved retention. Services like those that monitor credit inquiries can help you spot opportunities within your existing customer base and reach your customers before they move to a competitor. Superior returns. Tapping prospects when they’re in the market leads to a higher close rate. This approach also requires fewer resources — in fact, McKinsey found that they can free up 15–30 percent of their total marketing budget using this strategy. Integrating the use of signals helps to streamline your marketing efforts, but more importantly, it creates a better customer experience as you listen and respond to the needs of your customers. One of the strongest signals of intent is a hard credit inquiry. Services that monitor inquiries from credit bureaus can give you a list of consumers in the market for financial products. Check it against your customer records, and prescreen it against your chosen qualification criteria to identify the best prospects. Factor in customized underwriting criteria — such as a credit rating over a certain level — to develop a pool of members who are both in the market and qualified. Match them against a current customer list to see who are members and who are not. Proactively contact both members and non-members with messages and offers appropriate to them. As you can, extend a firm offer of credit that includes rates and terms so your customer can make an immediate decision to take your offer. This approach can do more than help you deepen your share of wallet with your current customers; you can use the same hard-inquiry data to quickly reach non-customers or communicate with new prospects while they’re actively shopping, as part of an aggressive, targeted loan acquisition strategy. 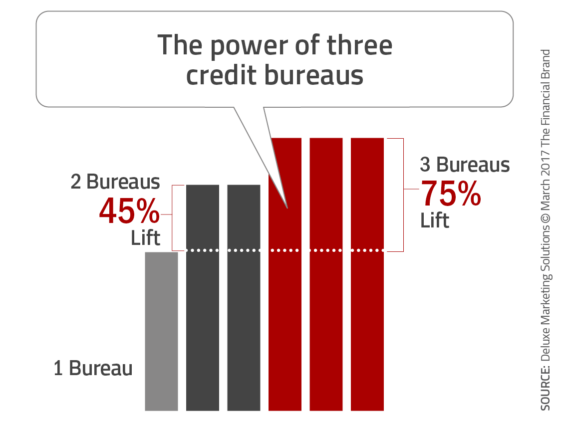 While there’s little difference in the data provided by each credit bureau, lenders who monitor only one or two bureaus are missing out on opportunities in the market around them. Using a service that taps data from all three bureaus produces a 75 percent lift over sources that provide data from just a single bureau, giving you the maximum qualified marketing universe. Using signals to both acquire and retain customers is a powerful component of a robust marketing strategy. And moving to a signals-based approach doesn’t have to be a major upheaval of your current processes. Continue using your proven methods, but try out new ways of interpreting and responding to signals. Concerned about how much budget you’ll need to free up to fund new tactics? If you start with a scalable offering with no obligation, you can test ROI before you expand your program. Traditional signals are still relevant and remain the foundation for customer-focused marketing. Combining them with powerful new signals that indicate intent to buy enables the proactive communication that takes financial marketing initiatives to the next level. Learn more about how to use signals as part of your omni-channel marketing strategy in the white paper, Signals: The Marketing Evolution You Cannot Afford to Ignore. This article was originally published on March 17, 2017 . All content © 2019 by The Financial Brand and may not be reproduced by any means without permission.